Sun., March 13, 2011, 12:01 a.m.
What: 51st annual Big Horn Outdoor Adventure Show, sponsored by the Inland Northwest Wildlife Council. When: Thursday-Friday from noon to 8 p.m.; Saturday 10 a.m.-8 p.m.; Sunday 10 a.m.-4 p.m.
Where: Spokane County Fair and Expo Center. Admission: Adults $9; seniors, students, military $8; kids under 7 free with adult. A ticket is good for all four days. Long after the sweat has been showered off, the gear’s stowed and the meat has been butchered, wrapped and stored in the freezer, the trophy on the wall recalls the hunting story for generations. The Trophy Territory room is an institution of the Big Horn Outdoor Recreation Show, which will run Thursday through Sunday at the Spokane Fair and Expo Center. Hunters from around the region bring the racks, horns and skulls of the big-game animals they harvested. Official scorers measure the trophies and give them scores so sportsmen can see how they rank among others. Among those that will be displayed for all to see is the in-velvet buck taken by a north Spokane teenage bowhunter on Sept. 1. Like most trophy hunting experiences, there’s a story behind LaFawn Sutton’s buck. Troubled by joint problems all her life, LaFawn struggled to condition herself and find a bow she could handle to follow her family’s interest in bowhunting. She shot the buck near her house on the family’s six acres in North Spokane, where deer had been parading through the yard to apple trees. “She made a great shot, but the arrow veered away from its vitals and we couldn’t find it before dark,” said Jim Sutton, her dad. Despite recruiting friends for the search, it was a day and a half later before they found the buck dead. “I’m proud of her for what she went through just to be able to draw the bow,” he said. “But I’m more proud about her patience. We didn’t know whether we’d find her buck, and she could have set up and shot another one in the time we spent looking for it. After official measuring by Pope and Young scorer Larry Carey, the buck scored 170 1/8 points, which ranks No. 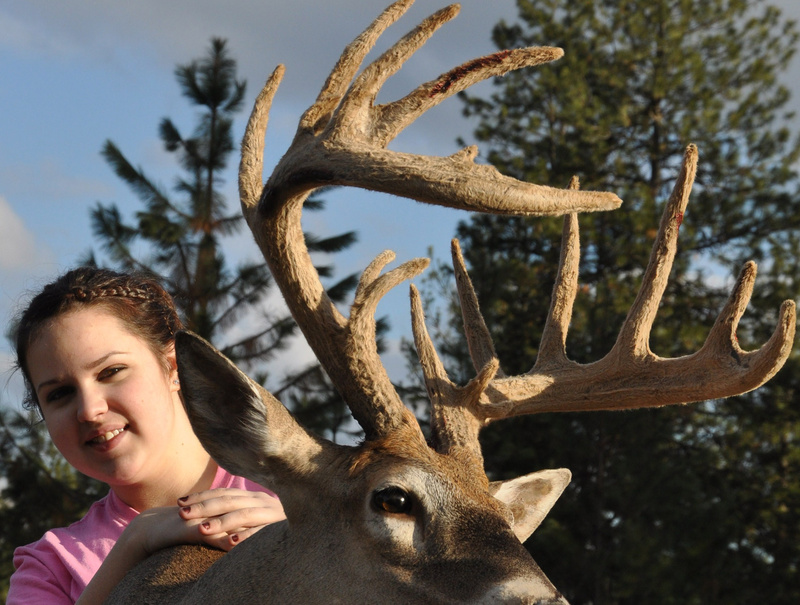 1 in Washington in the category of “whitetail archery velvet youth” for both nontypical and typical categories. Josh’s Taxidermy of Kettle Falls mounted the buck with a faux apple in its mouth. Trophy Territory: Big Horn Show trophies are judged and awarded in numerous categories. Several species and racks, in all shapes, sizes, and counts are considered. More than 300 mounts were on display at last year’s show. A rumor is circulating that a world- record mount could debut at the show this year. Wednesday-Friday, 9 a.m.-8 p.m., and Saturday, 9 a.m.-noon. Info: Larry Carey, (509) 328-6429. Published: March 13, 2011, 12:01 a.m.